I attended the Christian Fiction Readers Retreat this weekend in Cincinnati. My favorite part of the event was the presentation by inspirational authors Becky Wade and Dani Pettrey. While speaking to us about planning, writing, revising, and publishing a book, Becky illustrated the creation of a novel with M&Ms. When I asked for permission to share the activity on this website, Becky told me she could not take credit for the activity. Instead, she explained she first heard about the “M&M game” from author Karen Witemeyer. Becky created her own version to fit this event and shared her lists with me to include in this post. Thank you, Becky! 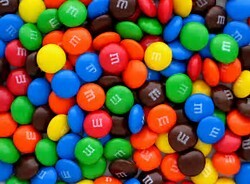 To begin, participants pass around a bag of M&Ms, removing one piece for each of four rounds. In Round 1, the color of our M&M determined the genre of our novel. We learned the setting of our story in Round 2. The professions of our heroine and hero were discovered in Rounds 3 and 4. We then spent a couple of minutes brainstorming different events that could bring our heroine and hero together. In the next step, we listed her story goal as well as his. Then we wrote and revised the first sentence of our story. This activity could be a fun way for writers to get those creative juices flowing before diving into the pages of a WIP. I wonder if it could help beat the dreaded writer’s block, though I don’t wish to find out on my own. And I think this would be a great way to entertain students during a classroom holiday party. I spent a few minutes jotting down possible characters and settings for Halloween and Christmas stories, and I invite you to take a peek at them HERE. Talking with authors and readers at the retreat this weekend motivated me. With about five weeks until this year’s ACFW Conference, I’m inspired to continue planning and plotting my next book. I hope to provide an update on my novella and first full-length novel in my next post. Thank you for reading.